I've had some people ask about my feelings expressed about Shakespeare & Co.
One of the top things on my list of "Things I Want To Do In Paris" was visit Shakespeare and Co., which I did, but which was disappointing. I knew this was not the original Shakespeare and Co., but that didn't matter to me. The "new" (opened in 1951) store is in a different location and how it came to be is, in its own right, every bit as interesting. This article is a must read for those who love this iconic bookstore, those who have visited and those who are still hoping to visit. Even though I was disappointed, I'll go back. And now I know the best time to go is in the evenings after all the tourists, like me, have moved on. My disappointment stemmed from the fact that the store was so crowded it was almost impossible to get in. Once in, it was, truly, impossible to move around. I found myself in one small spot and in that spot I stayed. Luckily, it was the little nook containing books relating to Paris and I did leave with the perfect books to bring home - "Rooftops of Paris," paintings by Fabrice Moireau, text by Carl Norac. It's gorgeous and I love it. And, I bought a book of Brassai's Paris photographs. And, a French version of "The Little Prince." And there was this. Signs posted all over the walls saying "NO PHOTOS." For those not familiar with the rich history of Shakespeare & Co., I've included a couple of excerpts from the article I mentioned above. 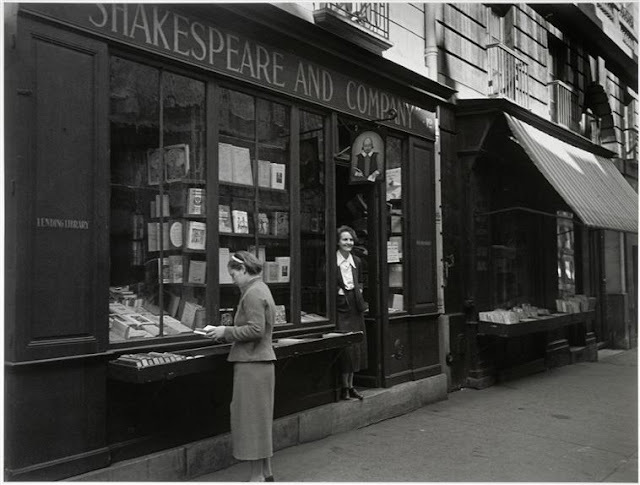 "Just in case you’re not up to speed, the original Shakespeare & Co opened in 1919 at 8 rue Dupuytren in Saint Germain before moving to a bigger location a few streets over to 12 rue de l’Odéon. This was the original bookstore that became a second home to the members of the “lost generation” including Hemingway, F. Scott Fitzgerald, Gertrude Stein, James Joyce and so on. The Shakespeare & Co we know today facing the Notre Dame along the river Seine was opened in 1951 by American ex-serviceman George Whitman, under the name Le Mistral. In the absence of Sylvia’s store, after which he modeled his, Whitman’s bookstore also became a focal point for literary culture in bohemian Paris, this time for the beat generation; nurturing the likes of Allen Ginsburg, Henry Miller and Anaïs Nin. George befriended Sylvia in her retirement and while dining together one night in 1958, she publicly announced that she was handing the name to him for his bookshop. It wasn’t until Sylvia Beach died in 1964 that Whitman renamed the shop Shakespeare and Company in her memory. He described the name as “a novel in three words”.